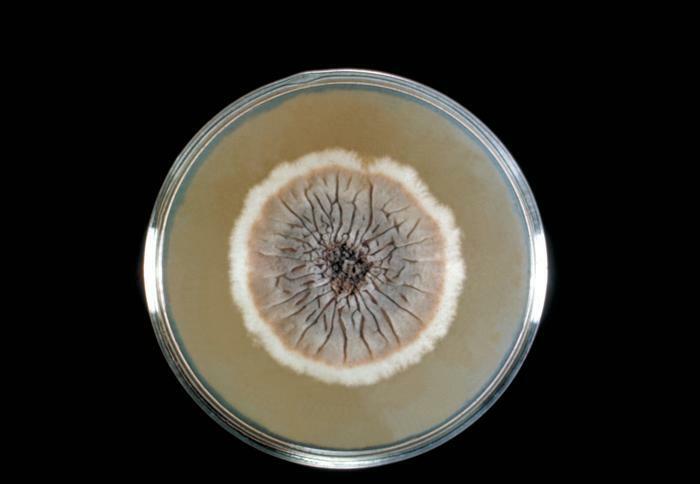 Fungi can be broadly classified into two groups; yeasts and molds. Yeasts are single celled organisms that reproduce by budding but molds grow as filaments like structure. Many medically important fungi shows unique behaviour based on temperature of growth and habitat, which is known as dimorphism (di: both, morphism: morphological form). These dimorphic fungi exists as molds in the environment at ambient temperature (25°C– 30°C ) and as yeasts (or other structure e.g., spherules in case of Coccidioides immitis) in human tissues at body temperature (35°C -37°C). Most of the dimorphic fungi causes systemic mycoses and Sporothrix (one of the dimorphic fungus) causes subcutaneous mycoses. Inhalation of spores of these dimorphic fungi causes systemic mycoses. Blastomyces dermatitidis: B. dermatitidis is a dimorphic fungus that exists as a mold in a soil and spherule in tissue. The yeast has a characteristic double refractive wall and a single broad based bud. Paracoccidioides brasiliensis: P. brasiliensis is a dimorphic fungus that exists as a mold in soil and yeasts in tissue. The yeast is thick walled and have multiple buds. It causes South American Blastomycosis. Coccidioides immitis: It is a dimorphic fungus that exists as a mold in soil and as a yeast in a tissue. It causes coccidioidomycosis. Among the subcutaneous mycoses causing fungi, Sporothrix schenckii is a notable dimorphic fungus. It causes sporotrichosis. Penicillium marneffei is a mold at environmental condition and yeast form is seen in tissues. It is a opportunistic pathogen causing systemic penicilliosis in AIDS patients in Thailand, China, Hongkong, Vietnam and other parts of Southeast Asia. Note: Candida and Cryptococcus are not dimorphic fungi they are true yeast. Cryptococcus neoformans is an encapsulated, unicellular (yeast). It can cause pneumonia and cryptococcal meningitis in immunocompromised patients. Candida is a yeast; it can cause Candidiasis (oral/vaginal “thrush“). In immunocompromised individuals invasive candidiasis may develop. Why Viral Nucleic acid (Genome) is unique? Thanks for providing this information. It’s easily understood. That’s for providing that mnemonic !